Mourners and heads of state gathered in Genoa, Italy on Saturday for a state-run funeral to honor victims of the highway bridge collapse on Tuesday. The death toll in the disaster rose to 43 on Saturday. 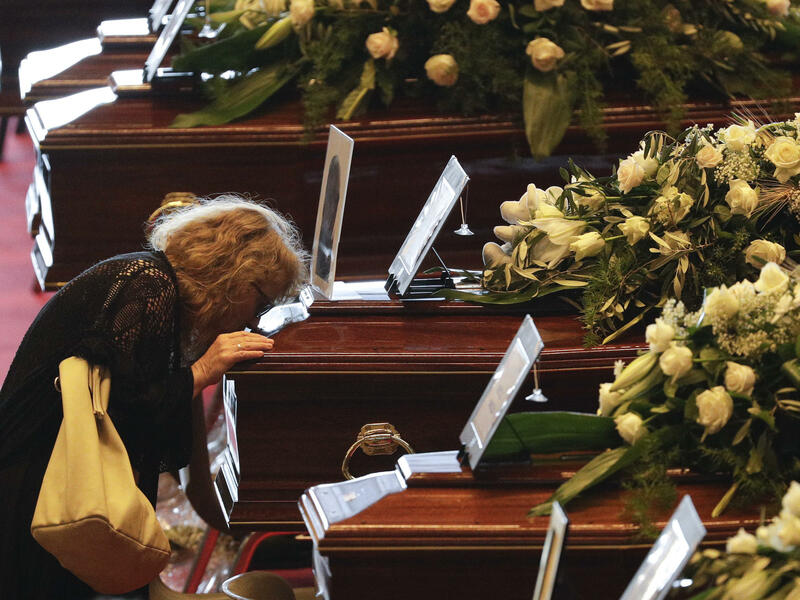 Families of 19 victims in the deadly bridge collapse in Genoa, Italy gathered on Saturday at a state-run funeral. At least 38 people died when a section of Morandi Bridge collapsed in the Italian port city just before noon on Tuesday, sending cars and trucks tumbling to highway A10 below. The Associated Press reports that the death toll is expected to rise. Rescue workers uncovered four additional victims of the tragedy early Saturday, and a Genoa hospital says that a Romanian truck driver died in the evening. Italian President Sergio Mattarella and Prime Minister Giuseppe Conte attended the service, which was held in Genoa's exhibition center and led by Genoa's archbishop, Cardinal Angelo Bagnasco. According to the AP, Bagnasco said that Pope Francis called him to express condolences. This horrific event, Bagnasco said "gashed the heart of Genoa." Families of other victims have opted for private funerals. According to reports, some did so out of frustration with authorities. One local man at the state-run funeral held a placard that read, "In Italy, we prefer ribbon-cuttings to maintenance," according to the AP. Shortly after the collapse, Italian leaders blamed Audostrade, the private company that operates the bridge. According to ANSA, an Italian news service, Deputy Prime Minister Luigi Di Maio said this week that the Italian government would revoke Autostrade's contracts. Prime Minister Conte sent the company a "letter of complaint" on Friday to begin that process, according to reports. As NPR's Amy Held reports, Autostrade has defended its safety work. Between 2012 to 2017 "the company's investments in safety, maintenance and upgrading of the network have exceeded 1 billion euros a year," Autostrade said in a statement emailed to NPR. The company added that its safety investments have resulted in fewer deaths and accidents. After Saturday's state-run funeral, Autostrade held its first news conference since the tragedy. According to Reuters, Giovanni Castellucci, the company's CEO, said it was "premature" to comment on the government's process of revoking concessions. Instead, company Chairman Fabio Cerchiai offered condolences to the families of the victims. Autostrade has created a fund for families and reserved $500 million euros (about $572 million dollars) to donate to the port city for recovery. CEO Castellucci said that to his knowledge, Morandi bridge was in "good health" before the tragedy, and the company hopes to rebuild it. But he wouldn't go as far as to claim responsibility for the bridge collapse. "Apologies and responsibilities are things that are connected. You apologize if you feel you are responsible," he said.